Pouring water on the swimming pool in Greece. Many of us think we know our energy bills pretty well. For example, we know a central air conditioning system is a big energy user. But when it comes to pool energy costs, many of us don’t really know how much energy we’re using in the backyard or which piece of equipment is drawing the most. Owners of older pools, in particular, may be unaware that the old-fashioned, single-speed pump that’s held up well over the years is actually wasting a great deal of money. Here’s a look at how more efficient pumping can be the simplest energy-saving strategy available. The simplest way to think about pumping efficiency is that slower is better. Pool pumps are very much like automobiles, which get considerably higher gas mileage at lower speeds. Additionally, the circulation that is needed for proper filtering doesn’t require very much pump speed. If you have a single- or two-speed pump, chances are it will be running at a much higher speed than necessary most of the time, which wastes money. Not everything in a pool should happen at low speed. Pumps do indeed have more demanding jobs where greater speeds are needed, such as powering water features or turning up spa jets. The right speed is always the minimum speed needed to get the job done. With the need for different operating speeds, it’s easy to understand how old-fashioned, single- or two-speed pumps will almost never be the most efficient choice. That’s where variable-speed pumps shine. They can be programmed to run at different speeds to deliver the correct flow for each task, from waterfalls to spa jets to a suction-side vacuum. Operating cost differences can really add up over a few years. Running a variable speed pump often costs only a quarter as much as a standard single-speed pump. Depending upon local utility rates, cost savings can be as much as $1,500 per year in a 20,000-gallon pool. * And over the lifetime of a variable speed pump, the cost savings continue to multiply. While variable speed pumps have been with us for some time, there’s another exciting development in pump technology. 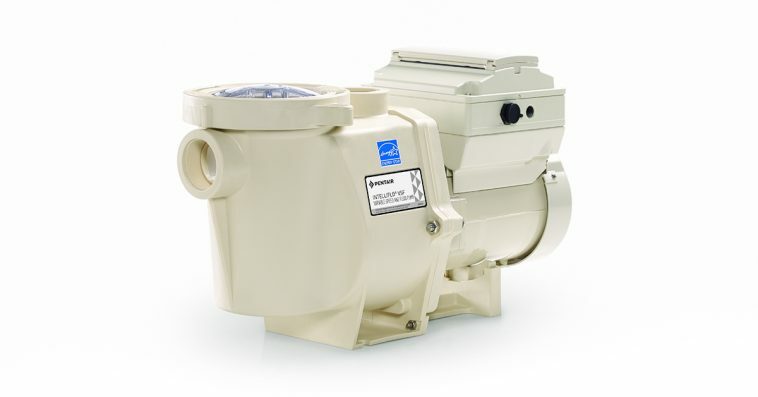 Industry and variable speed pump leader Pentair has introduced the industry’s first combination speed and flow pump. These pumps adjust to changing flow conditions (i.e., reduced flow as the filter accumulates debris) to maintain set flow rates. This results in maximum energy savings (up to 90%*), peak system performance and equipment longevity. Moreover, pool professionals are very enthusiastic about this technology, because it takes the trial and error out of setting up and optimizing a system that’s subject to changing flow conditions. Ultimately, the pump is the heart of both a pool’s operation and its energy management strategy. The larger and more complex your pool, the more you can benefit from choosing today’s advanced, energy-saving pump technology. Here are some ideas you can use to help maximize your pool energy savings. Many of them are things you can do yourself. And with a little help from service professionals for the more complex tasks, it’s a win-win collaboration. Adjust timers and automate schedules as much as possible. Whenever possible, set schedules so pumps run during nonpeak energy hours. Be sure to maintain the minimum required turnover. Consider seasonal adjustments. Note that algae growth is slower when days are shorter and sunlight is less direct. So, filtration times and chemical use can be reduced in winter months, even in pools that operate year-round. Keep filters, skimmers and pump baskets clean. At the time of installation or when upgrading, specify more hydraulically efficient plumbing choices, such as larger-diameter piping. Research utility reward programs for installing variable speed pumps.